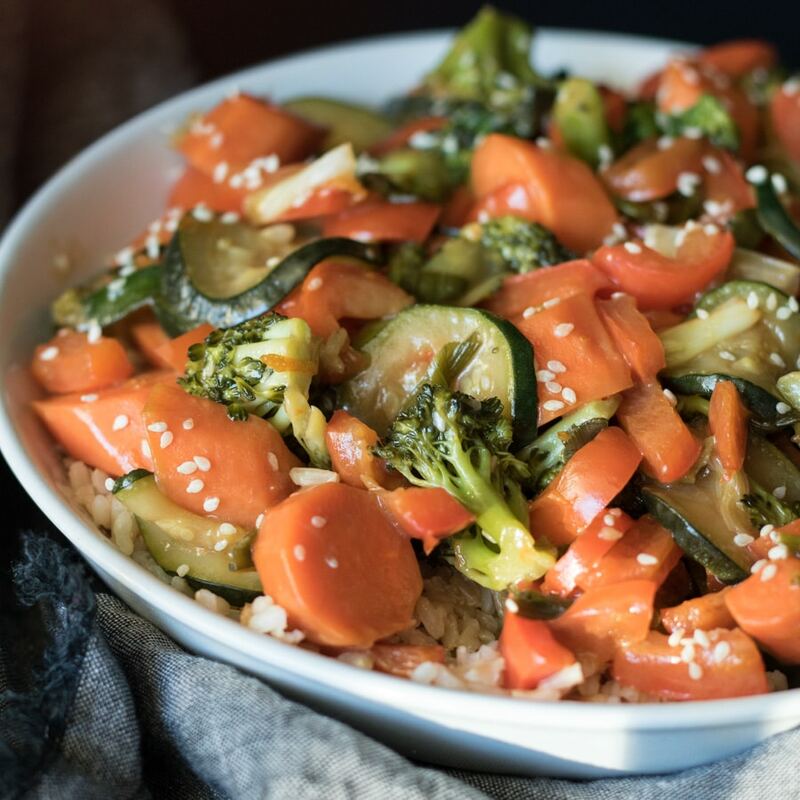 Orange vegetable stir fry is a quick and easy vegetarian recipe that’s low carb and bursting with healthy vitamins and lots of color. This 45 minute dinner idea is just what you need to serve for dinner tonight! Craving stir fry takeout? 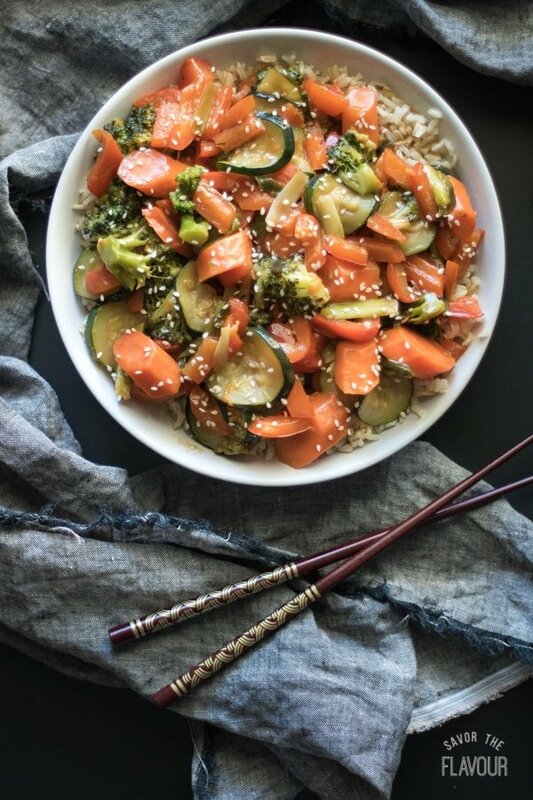 Forget the restaurant, and make up your own batch of our orange vegetable stir fry. This recipe is packed with 5 different colorful vegetables which give you a huge boost of vitamin C, vitamin A, and iron. 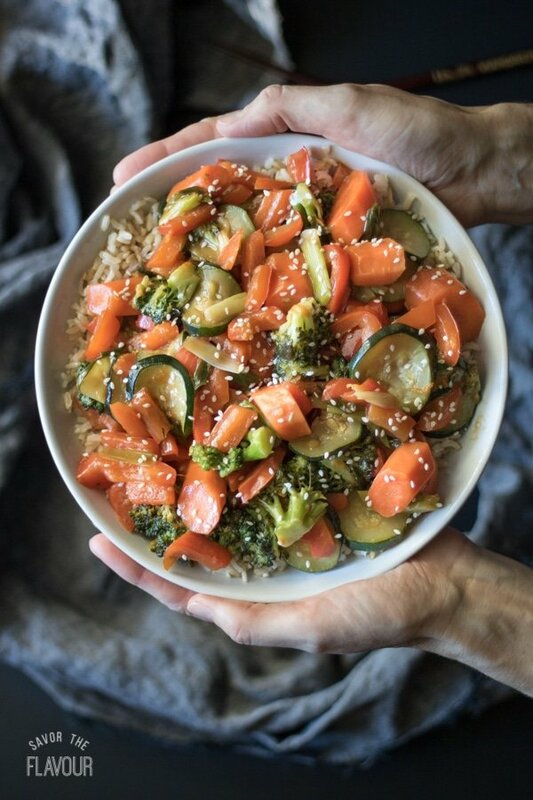 🌶🥕 Once the veggies are prepped, this stir fry cooks in only 10 minutes. 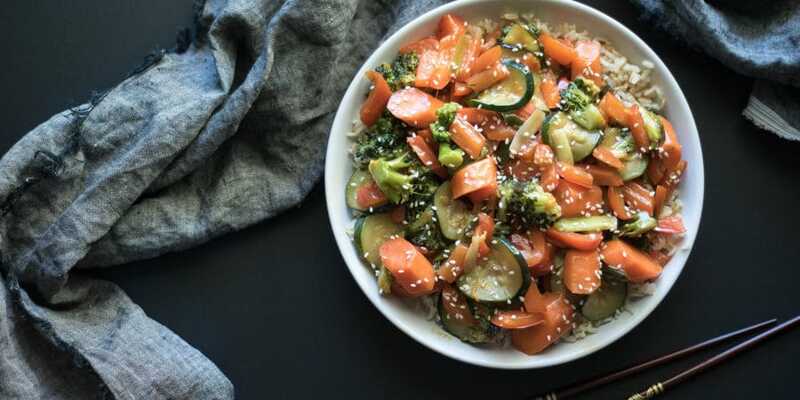 Serve this orange vegetable stir fry over fresh brown buttered rice, and you’ve got your bases covered for supper tonight. Put four cups of water in a covered pot. Bring to a boil. Stir in the 2 cups of rice. Reduce temperature to a simmer. Cook for 35 minutes with the lid somewhat askew, or until done. Remove from heat. Let stand for 5 minutes. Fluff with a fork and stir in 2 tablespoons of butter. Zest one medium orange. In a small bowl, whisk together the soy sauce, orange juice, cornstarch, sugar, and orange zest. Wash all the vegetables. Slice the red peppers into 1 1/2 inch strips. Peel the carrots and cut 1/2 inch slices on the bias. Slice the zucchinis into 1/4 inch coins. Cut coins in half, if they’re too large. Cut the spring onions on the bias in 1 inch lengths. Cut the broccoli into smaller florets and rinse. In two large saucepans, or a wok, heat the oil over high heat. Add the carrots and cook for 2 minutes, stirring occasionally. Add the rest of the vegetables and cook for 6 minutes. Make a hole in the middle. Whisk the orange sauce in the bowl, then pour it in the hole. Let it bubble and thicken up. Mix the orange sauce in with the rest of vegetables and cook for a minute. Serve hot over warm brown rice. Garnish with a sprinkle of sesame seeds. If you want to add more protein to this recipe, use 2 cups of leftover chopped chicken or 1 cup of walnuts.